and was just used for pumping. There was always a strong smell of creosote at the bottom of this old shaft which was about 100yards deep which was said to be due to the large Bradford Road Gasholder about three quarters of a mile away. The water pumped from this shaft was discharged into a canal arm long disused, which had been used much earlier for transporting coal. The whole area reeked of creosote. There had been a sister shaft called the Furnace pit about 50 yards away from the Forge, but this had been filled in during the 1920's and a washing plant built over it. 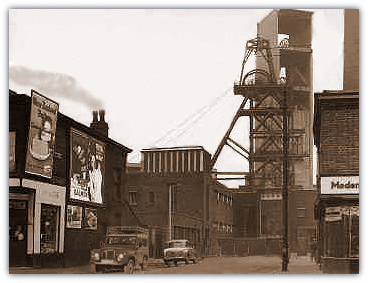 There were 5 pits in the Manchester coal basin, lying on the eastern side of the great Pendleton fault, and since Bradford Colliery dwarfed the others in terms of size, at the time of nationalisation it became the headquarters of the new group which was formed in the National Coal Board structure. 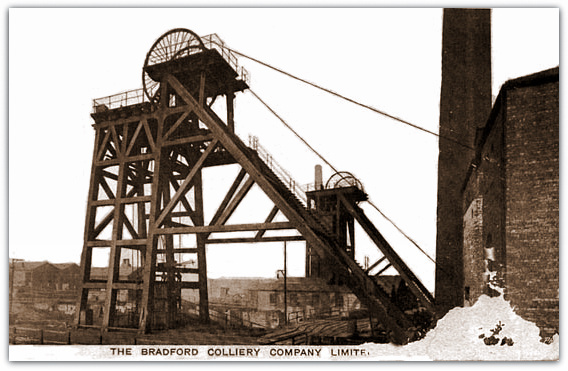 Bradford Colliery had been owned by the Livsey Brothers, which in time, became the Bradford Colliery Company, which in due course was bought by the Fine Cotton Spinners Group, who thought it would be a good idea to own their own coal supplies to power their cotton mills. There were at that time two coal seams being mined at Bradford, the Parker seam at about 600 yards from the surface, and the Crombouke seam at 1,000 yards, which was within a few years of the end of its life. Please note: there is little or no co-relation between the coal seams to the east and west of the Pendleton fault, even though some of the names were the same. The Crombouke seam was becoming exhausted, and although it was well known that there was a rich and profitable coal seam lying about 30 yards below Crombouke, the Fine Cotton Spinners, who were not mining engineers, simply didn't have the nerve to exploit it. About 1937 they sold out to Manchester Collieries Ltd., who had the resources to exploit it, and also the nerve. The new seam called the Roger Mine was about 7 ft. thick of high-grade coal, and it was estimated that there was about 100 million tons of it. There was not enough water or gas lurking to cause a big problem, but the gradient of the measures was steeper then l in 3, and it was also very hot. Immediately after the war a team of mining experts was sent to Germany to study German mining methods which were well in advance of the more traditional British methods. Development as far as the Lancashire Coalfield was concerned was to sink a completely new complex at Parkside, near Newton-le-Willows, and to spend large amounts of money to expand and develop the following pits: Bold Colliery, Mosley Common Colliery, and Bradford Colliery. At that time none of these pits was economic, Bradford Colliery was just about breaking even at 2,500 tons a day, whilst Mosley Common, consistently breaking records at 4,000 tons per day, was also making a consistent loss of £1 per ton. Such is the power of creative accounting. The country was short of fuel and foreign currency, and therefore the pits had to run uneconomically. At that time Bradford Colliery was making about 800 tons per day, and generally maintained this figure throughout the period of reconstruction, which lasted for several years. The No. 2 pit was taken completely out of use apart from emergencies, and deepened to a depth of 1,000 yards, i.e. the same as the No. 1 shaft. 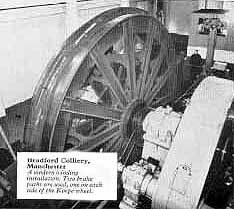 In 1948 the winding engines, made by Dagleish of St. Helens, had an odd configuration in that the ropes went backwards over the engine-man's head, and then over the headgear pulleys. The engines had been installed about 1870, but had not been overused for many years, apart from shaft deepening. Both headgears had been constructed from massive pitch-pine timbers, and were as sound as a bell when they were demolished in the 1950's. At the time they were built it was considered that the foul air in east Manchester would rapidly corrode steel headgears. The engines serving the No.1 pit were unusual in that they were vertical engines rated at 1,000 h.p., these were also manufactured by Dagleish, they were installed about 1900, and had seen a lot of use. Both pit shafts were 30 ft. diameter which at that time was considered large in the Lancashire coalfield. The diameter of the winding drum was also 30 ft. and at full speed the pit cages were reaching speeds of 60 miles an hour. The payload of coal lifted at the time would be about 3 tons. There was a range of Lancashire boilers supplying steam for the two winding engines, and the mine fan, which could also be driven by an electric motor at 500 volts d.c. In one form or another the pit had been electrified from its very early days, and the older hands could, and did, describe to me many of their hair-raising experiences from the past. Most of the in-bye equipment had been installed by Manchester Collieries and was relatively modern, if poorly maintained.